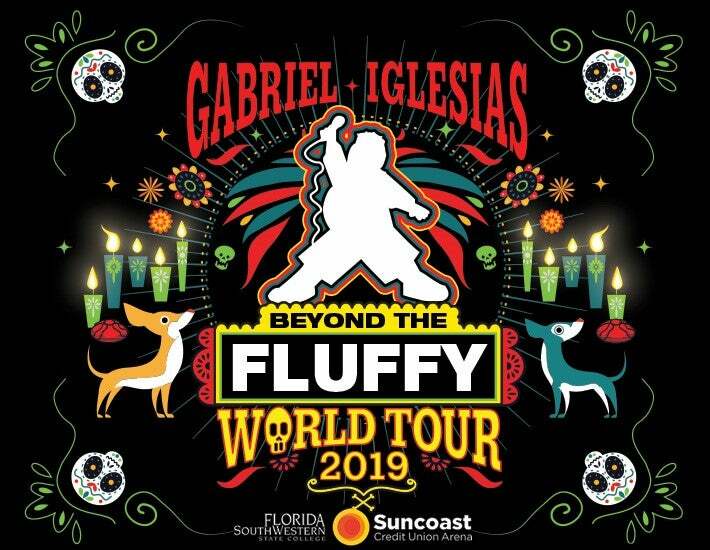 Comedian Gabriel Iglesias will be performing at Suncoast Credit Union Arena at FSW on April 28. This part of his all new 2019 “Beyond The Fluffy” World Tour. The tour kicks off February 8th, 2019 at the Wagner Noel Performing Arts Center in Midland, TX. Other cities on the tour include Dallas, Phoenix, Daytona, Nashville, Indianapolis and Salt Lake City. Tickets go on sale November 1 at 10AM at the Box Office, online at www.bbmannpah.com or call (239) 481-4849. Iglesias is one of a handful of comedians with the distinct honor to headline and sell out the Staples Center, Madison Square Garden and the Sydney Opera House. In addition to being one of America’s most successful stand-up comedians, Iglesias is also one of the most watched comedians on YouTube with over 380,000,000 views and has over 14 million fans across social media. He was recently featured in The Hollywood Reporter’s Top 40 Comedy Players of 2018 issue alongside comedy giants Jerry Seinfeld, Chris Rock and Lorne Michaels. Iglesias is currently in production as star and Executive Producer of the upcoming multi-cam comedy series for Netflix Mr. Iglesias. Iglesias plays a good-natured public high school teacher who works at his alma mater. He takes on teaching gifted but misfit kids to not only save them from being “counseled out” by a bully bureaucrat Assistant Principal, but also to help them unlock their full potential. The series will have 10 half-hour episodes and will premiere in 2019. In addition to the Netflix comedy series, Iglesias will star in two stand-up comedy specials for the network. The first, titled One Show Fits All, was recently filmed in front of a sold out audience at the Toyota Center in Houston and will air in early 2019. His second special for the network will tape sometime in the next year, both of these specials are follow-ups to his highly successful 2017 special I’m Sorry For What I Said When I Was Hungry. Iglesias’ prior television appearances include Comedy Central’s hit series Stand-Up Revolution and the comedy special Gabriel Iglesias: Aloha Fluffy, an unprecedented two-night comedy special generating over 15 million viewers. The special was a follow-up to his previous DVD specials, Hot & Fluffy and I’m Not Fat...I’m Fluffy, which have sold millions of copies. In the feature film arena Iglesias has signed on to star in STXfilm’s animated feature Ugly Dolls alongside Kelly Clarkson, Pitbull, Blake Shelton and Nick Jonas. His other film credits include A Haunted House 2, Show Dogs, Magic Mike, Magic Mike XXL and the animated films Coco, Ferdinand, The Star, Smurfs: The Lost Village, Norm of the North, The Book of Life, The Nut Job and Disney’s Planes. Gabriel also starred in the theatrical stand-up concert comedy film, The Fluffy Movie.